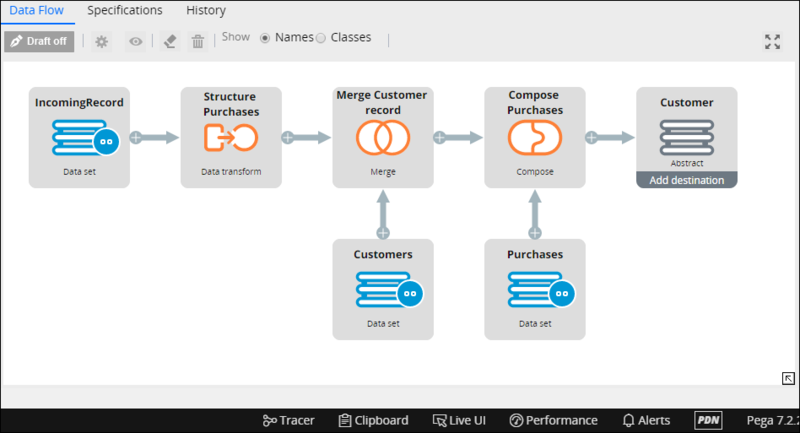 The new Branch, Convert, and Data Transform shapes extend the functionality of data flows in your application. By adding this shape in a data flow, you can create additional destinations. As the data enters the Branch shape, it splits into multiple paths that are processed independently. You can modify the data that is saved in each destination by adding branch-specific shapes in the connectors that radiate from the Branch shape. If you remove the Branch shape from a data flow, you also remove all branches and all their associated shapes. 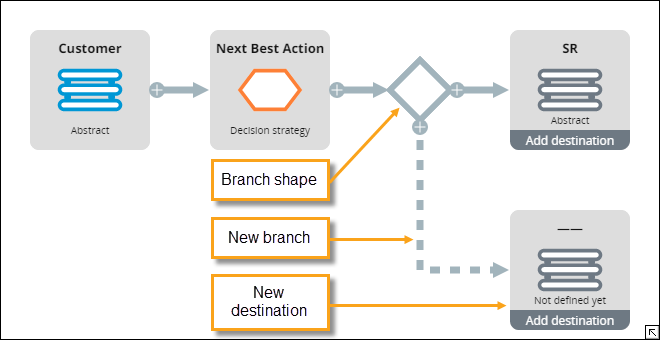 You create multiple branches in a data flow to create independent paths for processing data in your application. In Designer Studio, click Resources > Data Model > Data Flow. Click the Data Flow rule to branch. On the Data Flow tab, locate the Destination shape and click Add destination. 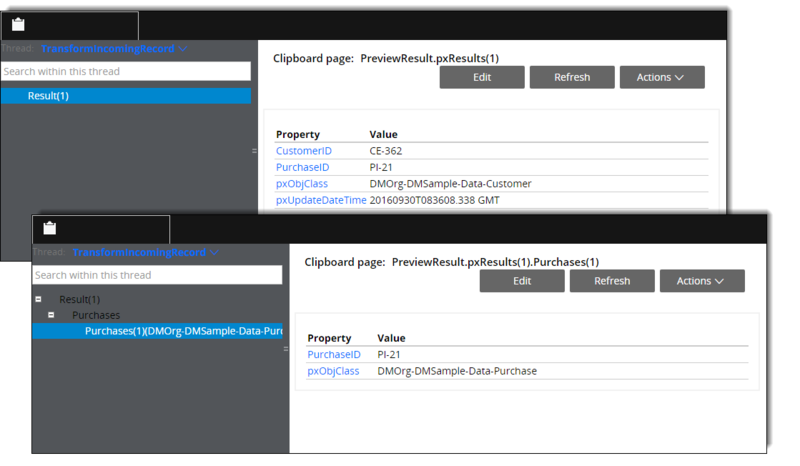 In the new data flow branch, right-click the new Destination shape and select Properties. Depending on the destination rule type, select the rule of that type to become a destination in this Data Flow rule or create a rule by clicking the Open icon. Optional: Click the branch and select Convert, Data Transform, or Filter to apply additional processing to the data in the new branch. These shapes are specific only to the branch on which they are added and do not influence data processing on other branches in the Data Flow rule. You can add multiple branch-specific shapes in a single branch. Optional: Repeat steps 1 through 8 to create additional branches in the Data Flow rule. 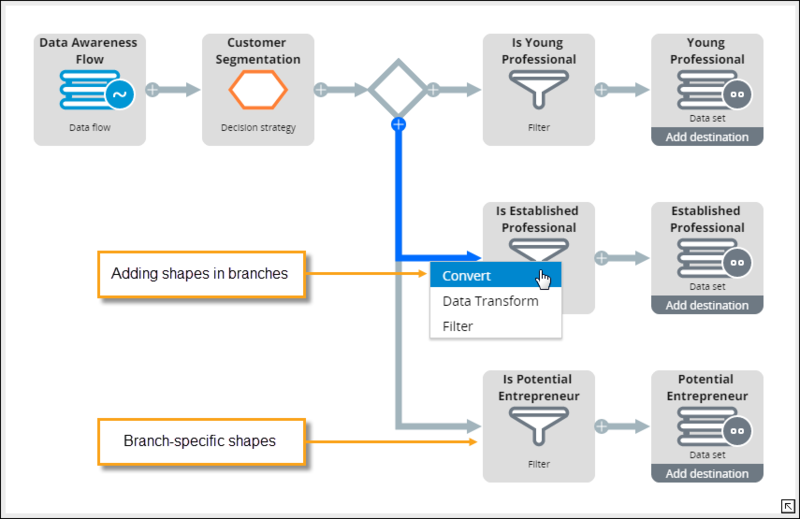 You can use the Data Transform shape in a data flow to perform complex transformations of your decision management data. To configure this shape, you reference a data transform in the same class as the incoming data or in a class in the inheritance path of the data flow. The Data Transform shape passes the input data to the data transform and propagates the results to the next shape in the flow. 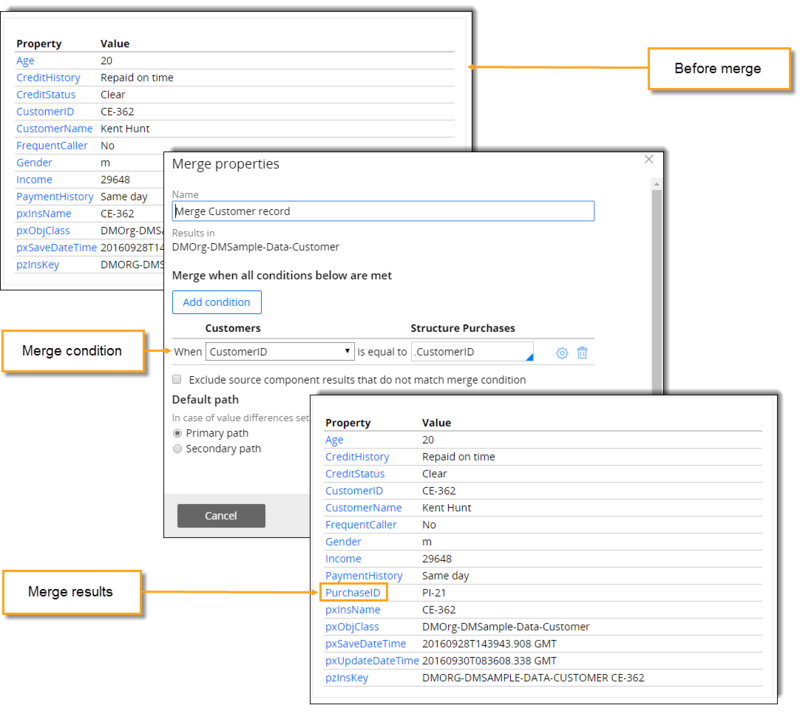 Further in the sequence of shapes in the data flow, a Merge shape combines the incoming transaction records with the customer records. The condition is that both records must have the same CustomerID property to be merged. Additionally, the merged records can be enriched with the information about other transactions (through the Compose shape) before being emitted to the destination data point. The additional purchases are part of the Purchases page. The Convert shape now supports page unpacking. 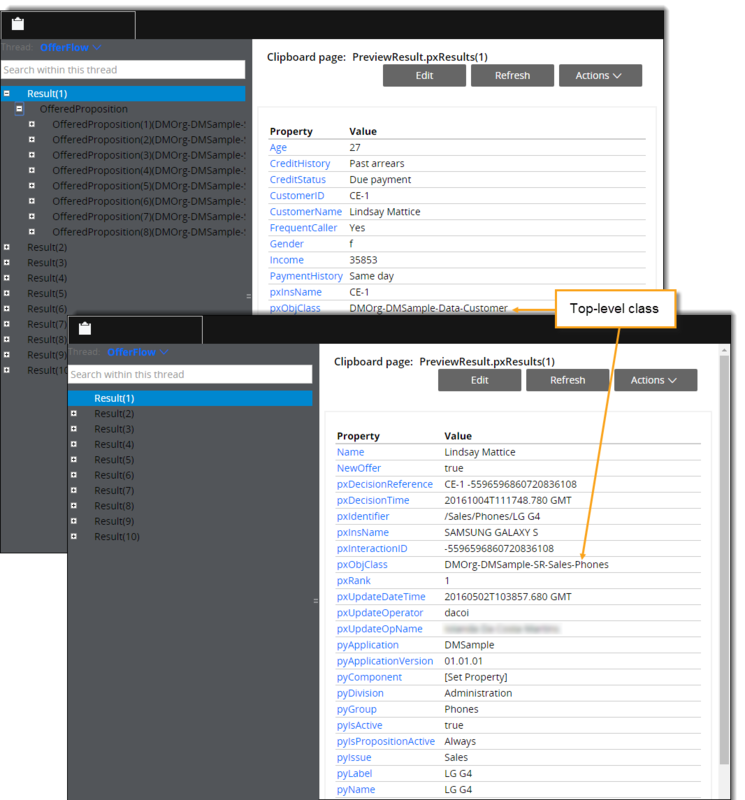 By using this new functionality, you can extract pages from the incoming page list properties. The extracted pages can be converted to other classes and propagated further in the sequence of the data flow. 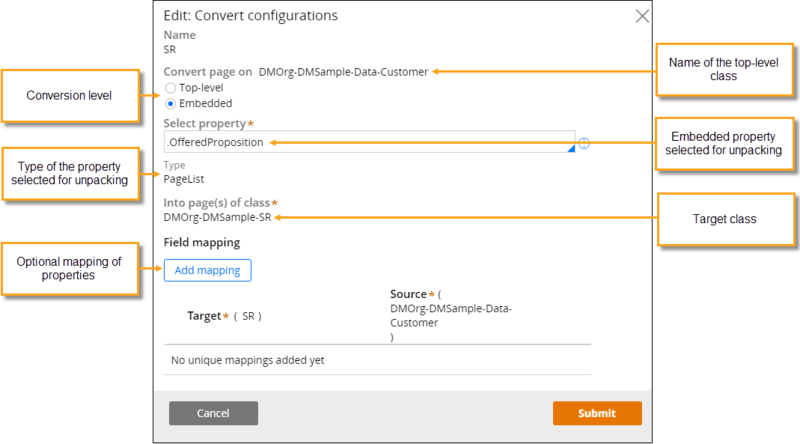 When you use the Convert shape, the source page list is preserved so that you can extract, convert, and propagate only values of the properties that are relevant to a particular use case or data set type. Design a data flow to write the full outcome of a strategy into a data set. The records must consist of customer data with the embedded propositions that were offered. 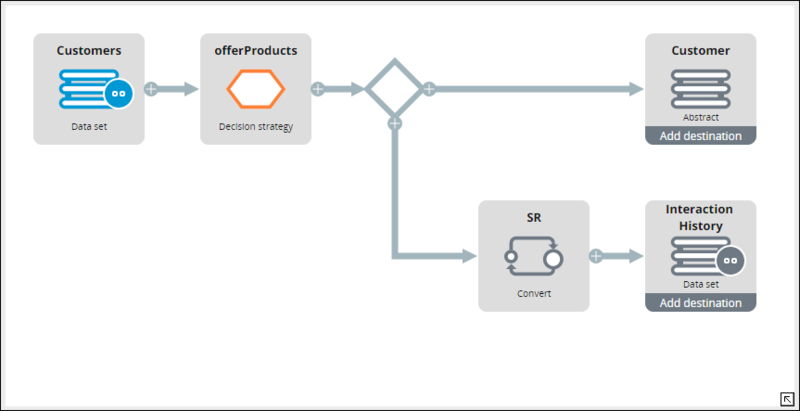 Use the same data flow to save the offered propositions to the interaction history. The records that are saved must belong to the Strategy Result (SR) class. The Convert shape extracts the OfferedPropositions property that contains the strategy results, converts the data to the SR class, and propagates the results to the Interaction History data set. The unpacked results can be viewed on the clipboard.